Manila, Philippines – Canon’s latest PIXMA all-in-one printer is accompanied by a new mobile app that is set to change the way we share photos forever. Beyond the obvious good looks, the new Message in Print app reinvents the way we remember favorite moments of friends and family, by embedding hidden messages inside photos for unexpected surprises. PIXMA TS5170 Photo All-in-One: This space-saving all-rounder delivers style and functionality at an affordable price. A 2.5” LCD on an adjustable tilt panel makes it easy to operate and view menu options, while automatic duplex engine and 2-way paper feeding ensures ease-of operation, whether it is the printing of high quality photos, school projects, and just scanning documents. Imagine a birthday greeting that pops out from a photo of a child blowing out birthday candles, or a postcard of a concert jumping to a video of the actual performance. The new Message in Print app makes these all possible. The app allows the creation of personalized messages with animations, or links to web videos that can be embedded in any photo. All that is needed is to view the photo via the app to unlock the surprise! With Bluetooth Low Energy (BLE) technology, also commonly known as Bluetooth 4.0, users can interact with their printers on a level that was never possible before. With BLE, it is now possible to stay always-connected to PIXMA printers via the Canon Print Inkjet/SELPHY app . 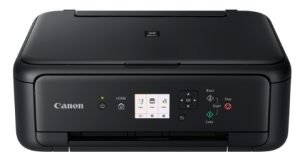 Users can enjoy easy wireless printer setup, and receive status alerts such as low-ink notifications or when there is no paper in the tray – simply by being within Bluetooth discoverable range of the printer. The ability to load paper to be printed in two directions (rear tray and cassette tray) allows users to switch easily between two different paper types, such as plain paper and glossy photo paper. Those that do need to print a large number of documents can even fill both trays with A4 plain paper for a combined paper capacity of up to 200 sheets. The automatic two-sided printing function saves consumers both time and money by automatically printing on both sides of paper without the need to reverse a previously printed stack. The forgetful will find the Document Removal Reminder function incredibly helpful. When a document is left on the scanner glass after a scan or copy, a notification on the LCD panel together with an audio alert prompts the user to remove their original document left on the scanner platen. The ID Card Copying function allows double-sided ID cards to be scanned onto a single printout - while retaining the original card size. PIXMA TS5170 is an Advanced Wireless Photo All-In-One Printer with 2.5” LCD Screen and Auto Duplex Printing. Canon products are manufactured to the highest environmental standards that include Energy Star certification for energy efficiency and compliance with the EU’s RoHS for hazardous materials. Recycled plastic is used extensively and printers launched this year will conserve even more packaging materials with a streamlined packaging relative to last year’s models. In daily use, the Quick Start feature conserves electricity, while Auto Duplex printing and the ability to condense multiple pages on a single sheet reduce paper use significantly. At every stage from factory to home or office, Canon’s printers are designed to have minimal impact on the environment.